It seems the tumblrverse have discovered girlfags (a lose term that includes non-trans women with a fascination for gay male culture, as well as FTM crossdreamers and trans-men). It seems it is their sharing of gay male imagery that has pissed some homosexual readers off. Apparently any straight woman who find gay men attractive must be a perverted fetishist. The fact that both gay men and lesbians may worship the human body as well as a wide various of gender expressions is apparently completely unrelated to the girlfag's enthusiasm for gay men. Yepp, this is old fashioned invalidation of your opponents by labeling them as sexual perverts all over again, but now some of the persecuted have decided to become the oppressors. Another example of such attacks can be found over at the Facebook Girlfag and Guydyke group. "Stop the harassment of girlfags!" "Lou Sullivan, pioneer FTM trans-activist and girlfag"
The struggle of women, disabled, people of color and gay men and lesbians tells me that we have to be both patient and persistent, if we are to end this kind of persecution. The anti-toxin is, as in the struggle against homophobia, to show the human face of those marginalized and make people understand that these are nothing more (and nothing less) than another variation of that wonderful thing called humanity. Most reasonable gay and lesbian people will understand this, given their own life experience and their own suffering. But we need to explain it to them. I strongly recommend Julia Serano's new book Excluded, which provides an excellent analysis of this type of invalidation. Not a huge fan of the girlfags, as I'm not a gay man, and don't like being confused for one, as I often am. That caption was meant to be ironic. I will remove the picture at once. Thank you Jack, for showing such concern. I didn't mean to, or expect to make you do anything about me not liking the caption. I didn't even think about it being you that wrote it, lol. It was a good picture. Sorry for only giving negative feedback, I was just taken aback, and tunnel visioned on it. "Harry Benjamin Syndrome (HBS) is an intersex condition, which develops in the early stages of pregnancy and affects the process of sexual differentiation. 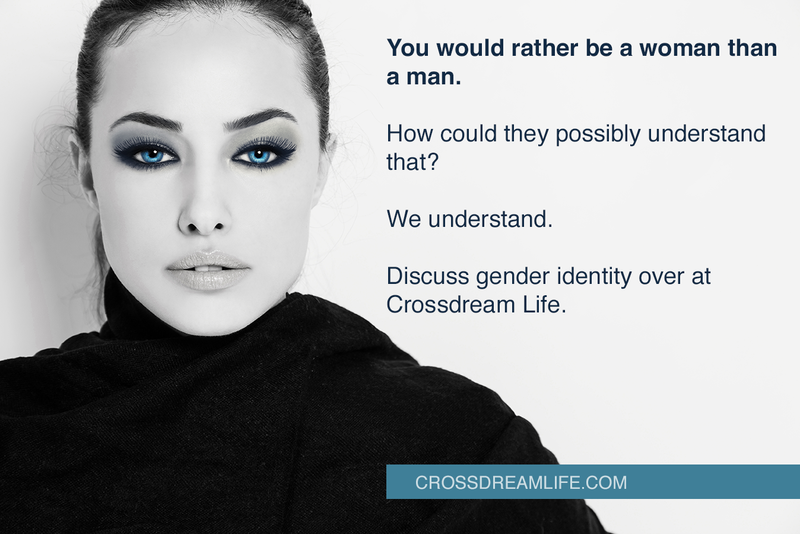 Let us not confuse HBS with Gender Identity Disorder (GID). GID might well be classified as psychologically defined variant behaviors, whereas HBS is “hardwired” due to the structure of the brain. HBS, therefore, should be treated primarily as a biological/medical condition. Although statistics vary according to source, estimates of the occurrence of GID range from 1 in 100 to 1 in 500. Surely these numbers reflect behaviors that would have to include every man who has ever put on women’s clothing (fetishism, transvestism, and/or transgender behaviors). They do not reflect the incidence of HBS -- a much rarer condition, occurring as infrequently as once in 2,500 births, and possibly even less. There are many different theories concerning the development and the expression of GID behaviors, which should make clear the need to differentiate them from the medical anomaly of HBS. The conditions should not be lumped together as if the same entity, and the distinctions must be clearly elucidated by professional medical evaluators since treatment protocols differ"
What is interesting to note here is that all professionals working in the field of gender research understand GID and HBS to be one and the same thing (if Harry Benjamin were alive he would do the same since he never wrote of any such thing). Yet this person also states that it is an intersex condition (which it is cleary not)and that there is conclusive evidence that the brain of the HBS sufferer is different than a normal male brain which is also a false statement since the results of BSTc region differentiation are known to be, at best, inconclusive.